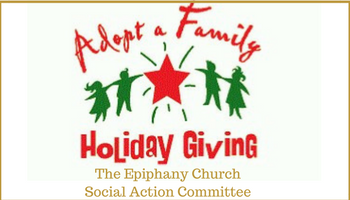 The Epiphany Church Social Action Committee is sponsoring the “Adopt-A-Family for Christmas” program, the students of The Epiphany School will be participating. Each class at The Epiphany School will be “adopting” a poor and underprivileged family from either FOX house (a woman’s shelter) or STEPS (Steps to End Family Violence). Every student will receive a flyer with the name, age, and size of one family member, as well as a suggested gift item for that person. If your child did not bring a flyer home, please contact their homeroom teacher. Please wrap your gift and label it with the recipients first and last names. These gifts are bagged and delivered to various locations so perhaps writing the name directly on the gift-wrap is the best solution. All gifts should be brought into your child’s teacher by Thursday, December 13, 2018. The Adopt-A-Family program is a school wide initiative with students from the Toddler Twos – Eighth Grade taking part, it is the Upper School’s Christmas Stars for Service project. We thank you for your generosity during the Christmas season.